SmartScoop Review – Find the best automatic litter box here! The SmartScoop Self-Cleaning litter box is a rake-style box that collects pet waste and pushes it into a hidden compartment with a scoop inside. Once the compartment is filled with waste, simply open the panel, lift out the scoop, and deposit the waste in the trash or toilet for flushing. This box waits for 15 minutes after your cat uses it before running a cleaning cycle. That’s long enough for clumps to form so they’ll get picked up more easily by the rake. If a cat gets back into the box, the 15 minute timer will be reset. The SmartScoop’s waste compartment features a carbon filter that helps absorb odors. The filter works well, but it will need to be replaced after about a month of use. You’ll need to change the bag in the waste compartment about once a week depending on how many cats you have. SmartScoop comes with a six-month supply of carbon filters, plus 24 waste bags. Once those bags run out, you can use regular plastic bags from a grocery store, so there’s no need to buy more. 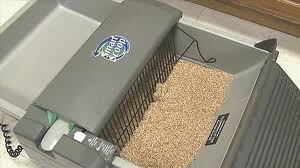 The box also comes with a litter-catching mat to collect litter that falls out when the cat exits. The folding ramp makes it easier for cats to enter the box if they dislike hopping over the side. You can detach the ramp if your cats don’t need it. The SmartScoop is reportedly very quiet when it cycles. If the plastic rake mechanism needs cleaning, it’s easy to remove it and wash it as needed. Setup instructions are very clear, even for the technically disinclined. Some users reported that the rake mechanism pulled a large amount of litter to one end of the box. If this happens, just push the litter back in place with a regular scoop. If your cat has large stools, the rake might not always be strong enough to pull them into the waste compartment. 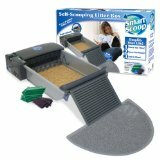 Click here to buy the SmartScoop Self-Cleaning litter box or learn more on Amazon. Watch the video below to see the SmartScoop in action.